Louisville, Kentucky's Audubon Country Club celebrated its centennial in 2008, inspiring a dynamic effort to research and commemorate the Club's rich history. 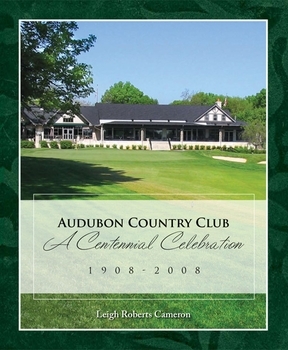 This limited-edition book is a comprehensive exploration of the Club's first 100 years, from its founding and the layout of its golf course by the "Johnny Appleseed of American golf," through the Club's milestones, golf championships, and evolution, all the way up to the festivities surrounding its centennial efforts. Filled with gorgeous photos, unique and historic images, and amazing anecdotes, this is the story of a beloved Kentucky country club, its dedicated members and staff, and many of its most famous guests. The story of Audubon Country Club began in 1908 with avid golfers Russell Houston and G. Robinson Hunt and their quest for a desirable and convenient place to pursue their favorite pastime. Club founders purchased one acre of land for a clubhouse and leased an adjoining farm for a golf course "way out in the country" on the Preston Street Road. They built an understated clubhouse, hired a nationally-acclaimed golf course designer, and created a golf course with an enduring original design on the leased land that in 1927 finally became Club property. Not only did their vision for a new golf course lead to the establishment of a magnificent Kentucky club and course, it led to the development of the lovely adjacent suburb and the City of Audubon Park. The neighborhood�s growth and stability were fueled by the success of the popular club. Like the golf course, Audubon Park was designed with the character and thoughtfulness to fulfill its mission of assuring the preservation of its dignity and "the increase of its value and beauty." In its first century, Audubon Country Club overcame the total destruction of its original clubhouse in a 1916 fire, continued to upgrade its facilities, expanded its amenities, offered quality entertainment, and built strong sporting traditions. The ever-improving golf course both charmed and challenged golfers from across Kentucky and the nation. From the second Kentucky Amateur Championship in 1912 to the 89th Kentucky Open in 2008, Audubon has hosted countless golf tournaments. One of the most competitive was the 1935 Louisville Open, a professional event that predated the PGA, and one of the most renowned was the 1942 Army-Navy Relief Tournament, a war relief effort that was headlined by singer/actor Bing Crosby and U.S. Senator A.B. "Happy" Chandler. In addition to its impressive golf legacy associated with such greats as Bobby Craigs, Bill Kaiser, Fred Allen, and Bobby Nichols, Audubon gained prominence for its outstanding swimming program. Since its first pool opened in 1934, the Club has supported a very active youth swim team that has been a unifying force among Audubon families for generations. From athletic pursuits to special events, the Club has always relied on the talents of its members and staff to sustain its unique social life in a beautiful, relaxing and inviting atmosphere. For 100 years, Audubon Country Club has brought enjoyment to its members, guests, and staff with what has been described simply as its incomparable "friendly feeling."